Hi everyone, it's been quite a while since I've posted, but rest assured I've been busy gathering research materials for the next few chapters of my War of 1812 book. Since one chapter in particular will deal with the Battle of Lake Erie, I've been doing a lot of reading in the naval aspects of the war on the lake. A lot has been written about Commodore Oliver Hazard Perry's lake campaign, some of it by such authors as Theodore Roosevelt. My own aim is to focus less on the Battle of Lake Erie itself, and more on the minor actions, logistics and adventures that brought the American fleet into being, as well as to discuss what happened to it after its great day in the sun. One of the more overlooked heroes of the war in the west was a skipper named Daniel Dobbins. Dobbins was involved somehow in just about every aspect of the war on Lake Erie, except for the actual battle--he and his schooner were at Black Rock picking up supplies for the fleet on September 10, 1813. Dobbins stayed active in the government service on the lakes throughout his career, and his son used his extensive papers to write an account which was published in the newsletter of the Buffalo Historical Society in 1905. His adventures make for fascinating reading. They also paint a picture of what life was like on the Great Lakes before the War of 1812-15. He was buried near the flagstaff in the Fort, on the east side of the mouth of Mill Creek. In 1808 or '09 his son (Isaac Wayne) came and disinterred the body and took it to his native place in Chester County. When the body was disinterred it was in such a state of preservation that to detach the flesh from the bones, he employed Dr. J.C. Wallace to boil it in kettles. One of his boots was so well preserved that Mr. Duncan, who kept tavern there, wore it, having a mate made for it. Erie Reserve, Aug. 27, 1807. Other cargo included salt, whiskey, pork, tallow, clothing, and even one "piano forte" bound for Detroit. On the return trips east he carried furs, maple sugar (called "mackock" on invoices of the day), hemp seed, and feathers. 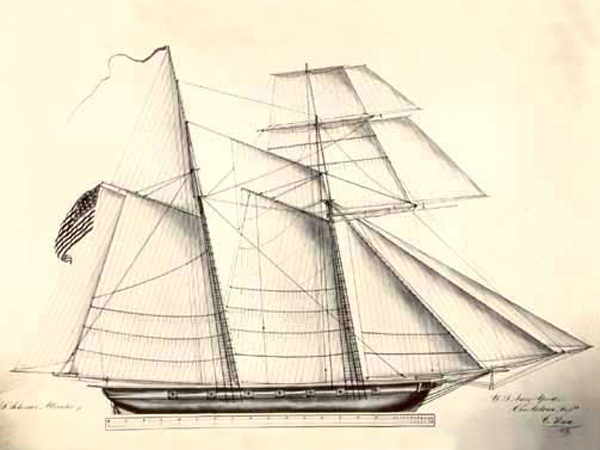 Dobbins seems to have traded up between various ships until he bought the schooner Charlotte in 1809 from the British Northwest Fur Company and renamed it the Salina, since he intended to carry mostly barrels of much-needed salt in it. It was in this vessel that the American sailor was caught at Mackinac Island by the onset of the War of 1812, and where his adventures would begin in earnest.